I find that modern board gamers tend to have a strange relationship with the classic abstract strategy games. By nearly any measure both Chess and Go are tremendously good games. They’re simple to learn and as strategically complex and deep as games go, yet the community of people who play them doesn’t seem to overlap very much with the community of people who play modern board games. Of course there are a number of reasons for this. Chess and Go are traditional games you’re likely to learn from your parents, or at least cross-generationally. Modern board games, at least in America, are an extension of the nerd/geek community that skews younger. They obviously have different paths to popularity–ancient games that are more or less ubiquitous in culture vs. games that spread largely through word of mouth in a short period of time among small communities. Chess and Go are also often played as what we would call “lifestyle” games. That is, they’re played competitively with a plan to improve, not simply play. With most modern board game communities, competition isn’t particularly tense–enjoyment comes from experiencing and discovering games rather than mastering them. But there are two major differences between the games themselves that I think account for the relative lack of overlap between the two communities: accessibility and theme. Both of these characteristics are part and parcel with the eurogame revolution in the hobby. Even the most ostensibly abstract euros will have some kind of theme attached to them, and all but the heaviest euros will be designed in a way that new players will have some idea of what to do right off the bat–certain strategic paths will be somewhat obvious. Chess and Go have neither of these attributes. Both are more or less completely abstract and provide no guide whatsoever to help new players understand what might be a decent play. 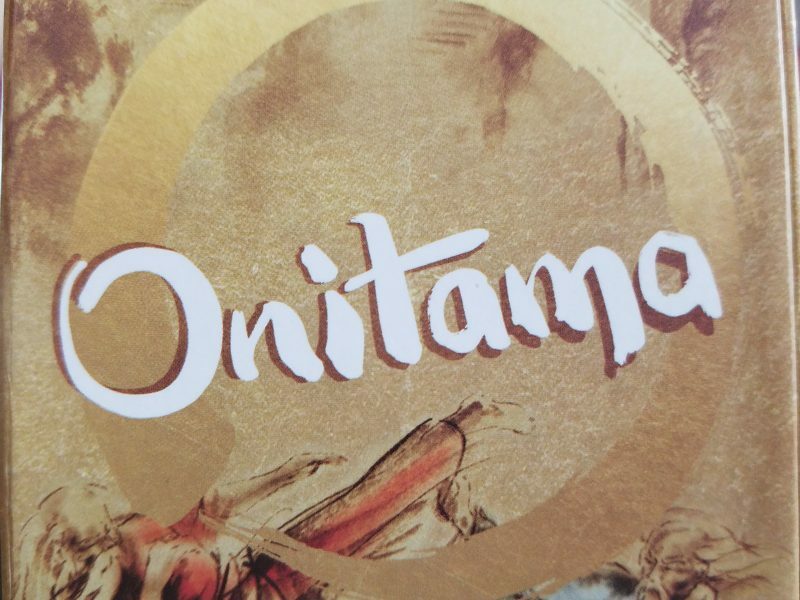 Onitama, one of the Dice Tower Essential games published by Arcane Wonders, tries to split the difference between classic abstract strategies and euro-style design. Largely, it succeeds at doing that, but loses something along the way. I’ll explain what I mean by that later. This design from Shimpei Sato takes the basic principles of chess and shrinks it down to something more than palatable for even the most casual gamers. Each side has 5 pawns that begin on either side of the 5×5 grid. One of the pawns on each side is the leader or master or something like that; the point is that it’s more important, because you win by either capturing your opponent’s leader or by moving your own to the center square on the opponent’s side of the board. 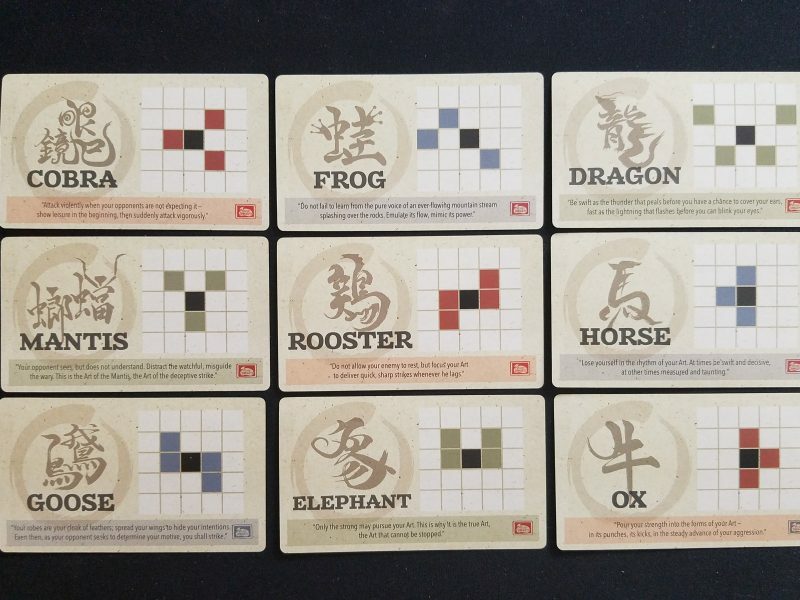 Onitama’s unique feature that separates it from other abstract strategy games, and what I suspect attracted Tom Vasel to put it in his “essentials” line of games, is the fact that the movement potential for each piece isn’t determined by the piece itself but by a rotating series of 5 cards randomly selected for each game. 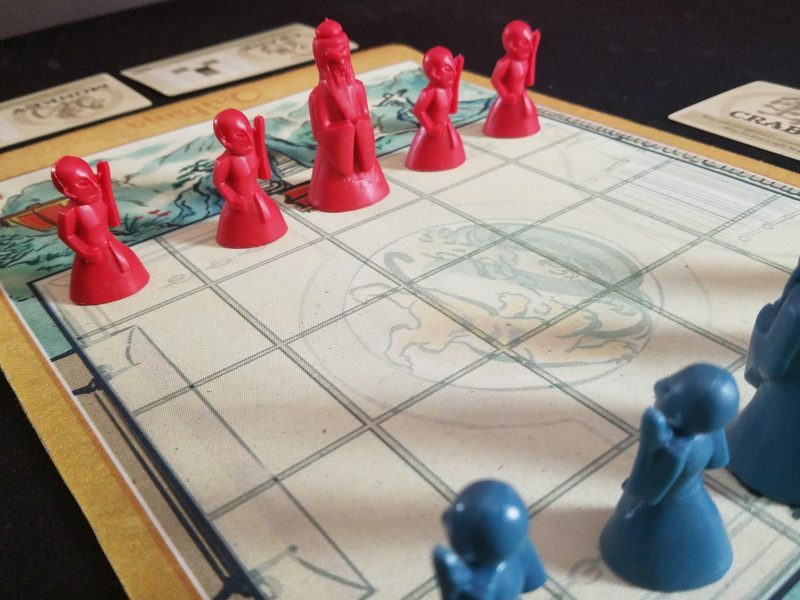 More than a novelty, the cards define everything about Onitama’s design philosophy of trying to make games like chess accessible to the casual eurogamer, and I kind of love it. The card system has a variety of functions outside of the obvious spice it brings to a traditionally dour genre of game. They allow more of the martial arts theme to come through, they make for easier move visualizations, and they put a soft cap on projecting ahead in the game. The theme is based around a fictionalized (from what I can tell) Japanese mythology that mixes vague martial arts ideas with using the spirits of animals. The details aren’t important, but it’s effectual enough with my western mind to make the game seem serene and disciplined and a number of other stereotypical martial art-ian adjectives. It fits because at their best, abstract strategies are about discipline of the mind and training and mastery. The cards help with move visualization because they explicitly draw out what kind of moves are possible. I find this tremendously helpful as I am forever plagued in chess by not being able to see the possible moves on the board. Bishops are my bane. They always hide away and jump out of the dark at me when I least expect it. Onitama has no jumping out of the dark, because the play area is so small and there’s only one card in the game that can move a piece two spaces forward. But when you look at your two cards, the one in the middle, and your opponent’s two cards, it’s so simple to understand the movement possibility space. When I serenely contemplate my next move like some kind of zen games master, I can see the pawn’s areas of control in my minds. It’s like those scenes in A Beautiful Mind, but more cool and impressive. But I can’t think ahead too much, because every time you use a card to move one of your pieces it rotates out of your hand and becomes the next card that your opponent picks up. This card cycling makes the game space a sandstorm that you have to somehow try to both see through and pilot. Chess masters can look a good number of turns ahead, because they understand all of the points of tension on the board at any one point in time. Once a move is considered, they can then see what kinds of responses cascade down from that nudge. It’s not simply a matter of seeing ahead, but understanding the current board state and eliminating large swaths of potentialities from consideration based on that knowledge. Onitama makes that kind of thinking much more simple. You can see where your pieces can move. You can see where your opponent can move, and you can control what new spaces will open up in the future. The points of tension and short term lines of attack are all there, looking at you. But try to peer further into the future and after a couple of rounds there will be an exponentially growing number of paths all dependent on card choices. You’ll probably not have enough information to narrow down that selection, making the exercise feel futile. Now I’m not saying that no one will be able to pierce that veil and hit a higher level of mastery in Onitama. I think it’s certainly possible. But the learning curve is very easy at first before steepening quickly. And I don’t have a problem with that–it caters to the modern gamer psyche that wants an approachable game that they can improve at over just a few plays. I don’t say that negatively. I enjoy that learning progression with my eurogames, so why wouldn’t I enjoy it here? Getting better at Onitama has been enjoyable. I started with understanding how to read the board and advance my pieces safely. Then I worked on trying to set up favorable trades or try to gain a pawn advantage. I tried to find plays that gave me positive tempo. Then I realized that you can control the game by controlling the cards. Only one card in the game that primarily moves right? Hold onto it and force your opponent to move into your traps or retreat backwards. Got the card that lets you jump forward two spaces? Don’t ever give it up and hold it until you can use it to create a checkmate. Your opponent will have a lot of trouble navigating around the potential use of that card. It’s a recipe for some wonderful tension and strategic counterplay. It also makes games start to feel familiar after a while. The board is so small that any forward progression will inevitably result in pawns clashing. With two competent players you’re always going to see a trade or two to allow for more freedom of movement. But if you don’t want to offer up a trade you can spend a lot of time moving back and forth in your back line, wasting time. Chess doesn’t have a lot of trouble with this due to pawns not being able to move backwards, and Go has the “Ko Rule” to prevent infinite stalling. Onitama has to rely on the cards generally being forward progressing and the players themselves to make something actually happen in the middle of the board. That’s a bit annoying, but I think the biggest fault that keeps Onitama from being truly great, or, dare I say it, essential, is its modest aim. In trying to capture the thematic spirit of an ancient classic while keeping with modern eurogaming experiential mores, it doesn’t fully succeed at either. Instead it comes out as a light distraction–an appetizer among succulent modern board game entrees. I wish I was compelled to want to master Onitama–to understand card combos better and how to manipulate my opponent into a winning position. Instead I feel like the stately abstract strategy aesthetic is a facade. It’s a nice facade with a cool rollaway neoprene game mat and stoic pawn figures, but a facade nonetheless. It’s not going to dethrone something as timeless as Go. But while I can recognize that Go is a stunning feat of game design, molded throughout millennia of play, I’ll probably reach for Onitama more often. There’s a reason we eat appetizers. They’re tasty and creative and fun.